Ernesto Guevara de la Serna, better known as Che Guevara or el Che was an Argentine-born Marxist, politician and leader of Cuban and international guerillas. As a young man studying medicine, Guevara travelled “rough”throughout Latin America bringing him into direct contact with the impoverished conditions in which many people lived. Through these experiences he became convinced that only revolution could remedy the regions economic equality leading him to study marxism. 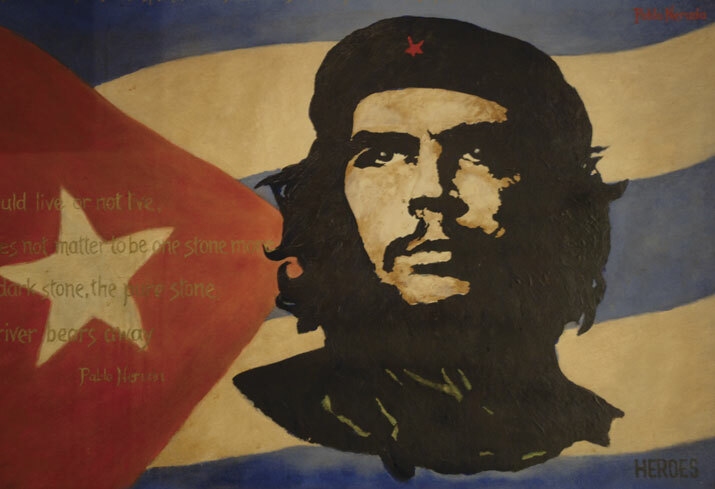 On 8th July 1953 Che was introduced to Fidel Castro and immediately joined the 26th July movement with the intention of overthrowing the Cuban Government. Guevara became a leader among the rebels, a Commandante (Major), respected by his comrades in arms for his courage and military prowess. On New Years Day 1959 Castros 3,000 guerrillas defeated a 30,000 strong professional army and to this day Castro remains the President of Cuba Guevara became an anti-Capitalist icon in the 1960s. In August 1960 Time magazine published a cover story on Guevara calling him “Castros brain” Guevara left Cuba in 1965 with the intention of leading more revolutions but was captured in a CIA/U.S.Army Special Forces-organised military operation in the mountains of central Bolivia. He died on October 9th 1967 at the hands of the Bolivian Army. Participants in, and witnesses to the events of his final hours testify that his captors executed him without trial.